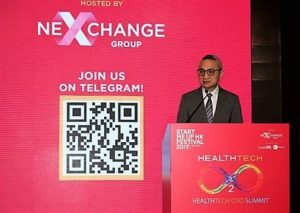 At the Healthtech O2O summit on day one of the StartmeupHK Festival 2019- organised by Invest Hong Kong (InvestHK) and hosted by NexChange- the opening keynote was delivered by Dr. CHUI Tak-yi, JP, Under Secretary for Food and Health, Government of the Hong Kong SAR. 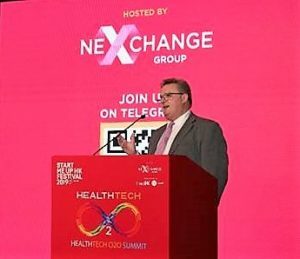 Stephen Phillips, Director-General at Invest Hong Kong, in his keynote speech noted how healthtech is something that touches us all and emphasised how the Hong Kong government has prioritised the sector. During the past year, the government has provided the sector with HK$78 billion (US$10 billion) in financial support, through a variety of investments, incentives and tax breaks. He added that the number of startups in Hong Kong grew by 18% in 2018, with jobs in the sector up 51% on the year, citing a recent InvestHK survey. 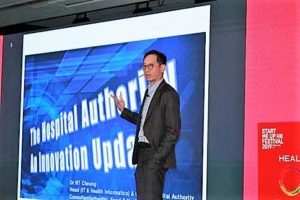 Dr. Ngai-tseung Cheung, Chief Medical Informatics Officer at the Hospital Authority in Hong Kong, talked about the never-ending project of upgrading Hong Kong’s healthcare system – moving from paper records to electronic patient records. Dr. Cheung said the Hospital Authority has a long-term strategy in place to deliver next-generation clinical management, enhanced patient experience and digital management. “We focus on technology that will deliver service impact,” he said. He added that a new form of governance was needed for innovation, because the normal system would not work – too slow. The process in place to review ideas and concepts and take the best ones through to funding and piloting may seem complicated, he said, but it’s much easier than what went before. The Hospital Authority’s first patient app came out in 2011. By 2018 it had 15 apps in operation – many intended as temporary, but not replaced. Dr. Cheung said they are now focusing on one single patient app. “HA Go is the name of the new app,” he said. “It has not yet been released.” He said it will trial in the second quarter and be released in the fourth quarter of 2019. It will handle appointment, payments, drug and rehab, along with other features as they get added. “We’re pushing into an era of data-driven care,” he said, adding that the Hospital Authority provides decision support in medications, such as drug combinations, for allergies and other conditions, and timeframes for drug usage. In 2017, he said, doctors changed their orders on 95,000 occasions based on computerised alerts. The concurrent safety checking – decision support at scale – and reviewing decisions, as well as providing check-lists for what might have been overlooked, create major savings and better healthcare.